Parakeets are capable of learning many different tricks. Parakeets, otherwise known as budgerigars or budgie's, are very intelligent birds. They are known to be excellent talkers and are capable of learning many tricks. If your parakeet is tame and has become comfortable with you, you should be able to train him to perform various tasks on command. The key to teaching your parakeet successfully is to begin with a couple basic tricks. Once the bird has learned these, you should be able to teach him several others. Acquaint the parakeet with your hand. Slowly place your hand on the outside of one of the sides of the bird cage. Leave it there for a few minutes as you talk calmly to the bird. Do this several times throughout the day until the bird no longer flinches when your hand appears. Open the cage door and put your hand inside the cage. Hold it there for a few minutes while talking calmly to the parakeet. Do this several times throughout the day until the bird becomes comfortable with your hand in the cage. Put your hand in the cage with one finger extended. Slowly approach the bird and touch him on the lower abdomen, just above his feet. As soon as you touch his stomach, say, "step up." 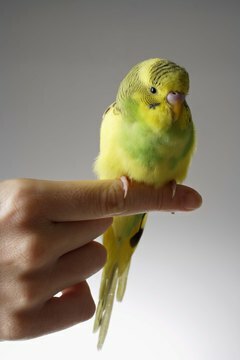 If he steps onto your finger, praise him, set him back on his perch and give him a treat. Repeat throughout the day until the bird steps up on command. Place your parakeet on top of his cage or on a T-stick. Put the tip of the target stick near his beak and wait for him to bite it. As soon as he bites it, click the clicker and give him a small treat. Repeat this step several times in a row until he immediately bites the target stick when it is presented to him. Place the parakeet on top his cage or a table and hold the tip of the target stick an inch or two in front of him. Wait for him to reach out and bite it. When he does, click the clicker and give him a treat. Repeat this step, each time holding the stick farther away. Place the parakeet on his cage and position his T-stick on a surface just out of his reach. Point the tip of the target stick on the T-stick. When he flies to the T-stick, click the clicker and reward him with a treat. Repeat this step several times, each time moving the target a little farther away. Training sessions should take place in a quiet room. If possible, cover any windows that are in the room. Remove food from the parakeet about an hour prior to the training session. This will make him want to work harder for the treat. Target sticks can be any stick that is skinny, but sturdy. Chop sticks and shish-kabob skewers (with the ends dulled) make good target sticks. A good treat to use as a reward is a small piece of millet spray. If your parakeet shows any distress during a training session, stop the session. Some steps may take several days for the bird to master and you have to be patient. Pushing your bird too hard can harm your relationship with him or even cause him to perform harmful behavior, such as destructive feather pulling. Avitrain.com: Let's Get Clicking With Birds!